Georgij Chaindrawa, a former minister of Georgian President Mikheil Saakasvili’s goverment, who was in charge of dealing with the conflicts with Abchasia and Ossetia until 2006, accuses Saakashvili of undemocratic behaviour and war mongering. In an interview with the German news magazine Der Spiegel, Georgij Chaindrawa accuses the United States administration of creating a pro-American Georgian government under Saakashvili. According to Chaindrawa, Saakashvili’s government bears little resemblance to a democracy. 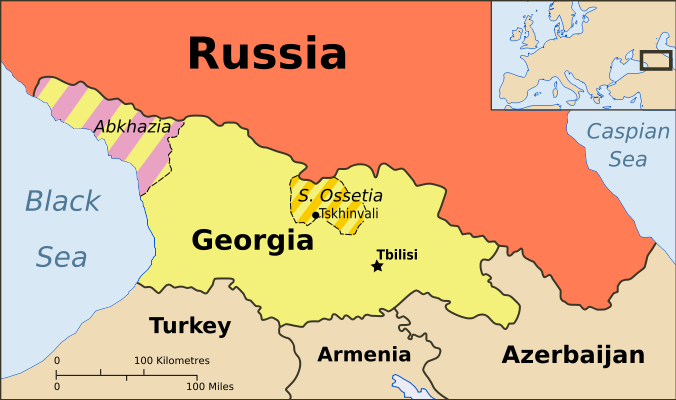 Rather, Chaindrawa claims that the government of Georgia is a totalitarian regime that suppresses civil liberties and the freedom of the press, somewhat similar to the Russian government policies of Vladimir Putin. Chaindrawa states that Saakashvili tried to close down an independent TV station (Imelda TV), declared a state of emergency in 2007 against mass protests of the opposition, and committed election fraud. Chaindrawa also asserts the politics of Saakashvili’s government as a cause of the current war with Russia. He says: “He wanted a victory parade in Zchinwali and got Russian troops marching toward Tbilisi”. When asked, why he was dismissed from the government in 2006, Chaindrawa stated that he tried to avoid military adventures in the conflict with South Ossetia and that he was highly critical of Saakashvili’s failed 2004 attempt to conquer Zchinwali. On the question, what the West should do, Chaindrawa replies, the West should support the Georgian population, its civil society and institutions rather than the Saakashvili government. He continues to say that Georgia needs politicians who are pursuing reconciliation and compromise rather than confrontation. In an article in The Washington Times, Tsotne Bakuria, a former member of the Georgian parliament and now a senior fellow at Global International Strategic Group in the U.S., formulates a similarly harsh criticism of Shakasvili’s government. She calls its government a “reign of terror” and says that the country has no independent judiciary and that Saakashvili uses trumped up criminal charges (alleged money laundering) to silence and suppress members of the opposition. She describes, that the leader of the opposition Shalva Natelashvili was forced to ask NATO secretary Javier Solana for asylum for his wife and his 2 daughters after they’ve received death threats. Natelashvili himself was threatened by a government member with arrest and is facing money laundering charges, as are other members of the opposition.